Vista Turf is proud to serve the community of Waxahachie with professional lawn care and pest control services. For more information or to get a free quote call us today at 817-307-0583. 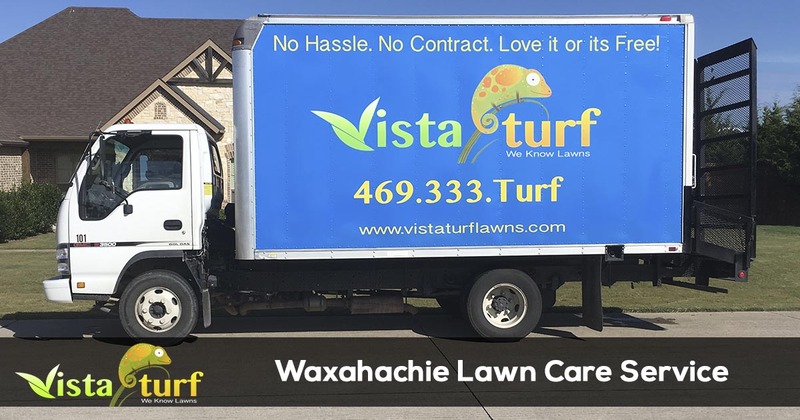 Since 2008, Vista Turf has been helping Waxahachie residence enjoy their evenings and weekends by taking care of their lawn, landscape, and pest control needs. Our customers enjoy the extra time by golfing at the Waxahachie Country Club, taking the kids to the Waxahachie Sports Complex, or spending time at Lake Waxahachie. Our team of licensed professionals provide all of the lawn care services you need to have a beautiful weed free lawn, landscape, and can even help keep the pests away with our outdoor pest and mosquito control services. Our customers tell us we are the best lawn care service in Waxahachie. We contribute that to our focus on customer service and providing quality lawn care and pest control services. Our team of dedicated professionals work hard everyday to exceed the expectations of our customers, by providing quality services at an affordable price. Our comprehensive services will keep your lawn and landscape looking great no matter the season. We are environmentally conscience and tailor our services based on the current watering restrictions in Waxahachie which can be found on the City of Waxahachie website. Vista Turf is the industry leader for lawn care and pest control in Waxahachie. We offer a money back 100% satisfaction guarantee with all of our services, so there is no risk for you to give us a try. Give us a call today for the fastest service at 817-307-0583.